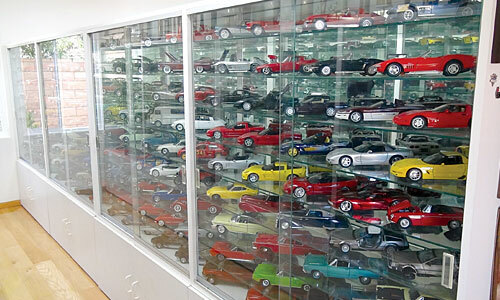 For many of us, diecast model collecting is a passionate pastime, a life-long hobby, and a way to enhance our love of cars and celebrate the lore (and lure) of automobiles. And nothing can be as funny – or downright wild – as the reaction of a non-collector who’s seeing your collection for the very first time. So – what’s your story? Tell us about some of those reactions. Was it a big surprise… shock and awe…or just a big old “wow!”? We’d like to hear from you. Please post your story below! Thanks for the kind words Clay! Thanks a lot! It’s been a lot of work (if you can call spending the day playing with cool model cars “work”), but we’re pretty happy with the direction we’re going in. Hold on tight – we’re just getting started. Thanks for reading Die Cast X! I have been collecting diecasts since 1997 . It became a hobby I was delighted by and inspired by as I am a car nut. I have about 500+ 1/18 scale models from all over the world. I cherish these a way a woman would cherish her diamonds. However to most of the people in my life, the view is that I am crazy and have a disorder that needs treating. How can a grown man have so many toys? How can you waste time and money… I need to “grow up” or “you’re sick”. Very few support my hobby, but I do not care. My cars bring a smile to my face and a are just plain fun to collect. That’s my experience with the hobby. Good day! One of the things that our editorial team always talks about when we get together is how some folks just don’t “get it” – and how the usual view of non-collectors is that people who collect must have some sort of personality disorder – a compulsion to gather up “things” to fill a hole in our lives. To which we say, “crap!”. Well, what we actually say wouldn’t be appropriate for this site, but you get the idea. At the end of the day, it all comes down to what makes you happy. As for those sourpusses who tell you you’re sick, or to grow up… I’d be willing to bet they wished they had a hobby, an interest, or a passion they could enjoy as much as you do yours. I almost – almost – feel bad for them. Thanks for writing- and for reading Die Cast X.
I hear that K.G. – my friends used to taunt me for my hobby to – My dad was especially that way until he realized how realistic they can be and now has a few 1:18th’s himself. Your not alone there are a lot of us out there – keep enjoying your hobby and keep sharing your experiences with us. Most people that see my collection for the first time are overwhelmed and wonder if there isn’t a 12-step program available for my affliction. I collect 1/43 scale endurance race cars primarily, cars that have competed at Le Mans, Daytona, Sebring, Targe Florio, etc., with vintage F1 thrown in as well. I have a large collection of Jaguar and Ferrari models as well. You had me at “Irish”, LOL. There are 12-step programs for our particular problem, but the meetings always seem to take place in the basement of the local hobby store. Thanks for sharing the link – we’ll have to check it out and post it on our Facebook page for all to see. Thanks for writing – and for reading Die Cast X.
I`m a collector of mainly 1:64 sport-, concept-, showcars but since the late 50`s I prepare myself miniature models. Some decades ago I met a Collector Club which was looking for further collectors to make the following exhibition greater. I told what type of diecasts I collect and at least mentioned that I prepare miniature auto models 1:75 curved from wood. They was interested only in this last sort of models. As I took the models from the boxes they stood around me and enjoyed the one off models. At last I took out my pride a Bugatti Royale chassis made of resin, plastic and metal assembled from more than 70 parts in the same scale. –	But you have a fa…ing bl…dy patience ! !- sliped out from one. Well, this was an insider opinion. But some days later came an obviously tipsy guy – perhaps he saw the great board over the gate „EXHIBITION” and thought it`s time to do something for cultur. He came in, paid the entrance fee and staggered in direct to the nearest glass-case where was my Bugatti. –	And what is the value of this small one ? –	About 400 $ ! –	Brrrr . . . . . ! and shuddered in all part of body and with the same impulse he turned and went out with his doubtful steps ! The name MUSCLE MACHINE MAD MAN should explain it all … and taking 800+ blister packs of 1/64th Muscle Machines and to make them fill 4 walls as wallpaper is something to see. I don’t even understand it myself … I have never been a collector that I can remember. But opening the door to the room and showing these to anyone who’s never seen ‘Um – It’s always the same = OH MY GOD ! I still don’t know if I’m a collector, or I Am sick ? I started collecting die cast cars since the 1990s. I started with 1:24 scale models. I accumulated some 20+ cars before I changed my mind. One by one I started replacing them with 1:18 scale models. At the moment I have some 60+ cars. For 6 years now my (die cast)car collection has taken a back seat to my new “obsession.” 1:35 WWII German Tanks and Vehicles. I have close to 30 of them. First reaction I get when visitors see my collection is “wow!” A few think of it as a “waste of money!” Some even ask me, “what am i thinking?” Its a good thing my wife is very supportive! She has bought some of the cars in my collection. Hi, I have a blog about diecast too.